Rebecca Haimowitz’ horrifying documentary short “62 Days” illustrate the awfulness of fetal personhood-inspired “Screw the mom, hatch the kid” laws. The very basic talking head format works for this short. It provides a necessary distance to appreciate the horror Texas’ fetal personhood law created for the Munoz family. JPS’ medical staff and lawyers hid behind the shield of state law to justify letting Munoz’ grieving husband see his wife’s skin turning waxy hard and to smell his wife’s flesh slowly rotting away. Erick Munoz’ day job is that of firefighter, so he’s seen human suffering on the job. But this state- and hospital-created ordeal has obviously scarred Erick’s soul. Meanwhile, the JPS doctors played an unamusing medical pantomime of finding ways of keeping Munoz’ corpse alive another few weeks while the fetus’ limbs continued to deform. JPS unsurprisingly doesn’t present a representative to defend their actions in front of Haimowitz’ camera. Late in the film, it’s revealed that over 30 other US states have fetal personhood laws like Texas’. Probably these other laws duplicate the Texas law word-by-word if the right-wing fanatics of ALEC had their fingers all over the drafting process. One way such despicable laws could even start to have a patina of justice is if it’s mandated that medical providers following such fetal personhood laws are obligated to bear all the costs of providing their unwanted resuscitation services. So not only would the JPS Hospitals of the world not be allowed to charge the pregnant woman’s survivors for keeping the woman’s corpse around, but they would be obligated to cover all her funeral expenses and even indefinitely provide psychotherapy services free of charge for inflicting the emotional trauma of watching a loved one slowly rot away. Then a small step would have been made towards justice for the survivors of these badly wronged women. Film animation pioneer Lotte Reiniger gets her creative due in the charming animated short “Lotte That Silhouette Girl.” Directors Carla Patullo and Elizabeth Beecherl tell how Reiniger went from being a girl charmed by the early silent films she saw to someone who made 70 films using animated silhouettes. The best known of Reiniger’s films may be “The Adventures Of Prince Achmed.” The silhouettes in the film were the products of Reiniger’s astounding facility with applying scissors to paper skillfully and effectively to get the shapes she needed. But her other major contribution to the film world would be the invention of the multiplane camera. Patullo and Beecherl let the pioneer animator tell her life story in the film’s voiceover. She proves a charming subject whose obvious gifts for cutting her shadow puppet figures “just so” clashed with Germany’s lack of professional opportunities and the changing pro-Nazi political climate. Reiniger’s obvious enthusiasm and love for her cinematic creations make it tragic that pristine copies of her many films don’t exist. Yet if the common person has forgotten Reiniger and her cinematic legacy, Patullo and Beecherl’s short may move the curious viewer to still seek out what survives of Reiniger’s oeuvre. Dropping atomic bombs on Hiroshima and Nagasaki may have brought a dramatic end to the Second World War. But those bombings had the unintended consequence of making the world popularly associate atomic energy with death and destruction. The Cold War and the events at Three Mile Island and Fukushima, among other events, certainly did nothing to generate positive feelings towards nuclear power. But now with general inaction in addressing human-induced climate change, could nuclear technology provide a feasible solution to humanity’s future energy needs? David Schumacher’s timely documentary “The New Fire” makes this case for reconsidering nuclear power. Schumacher’s film doesn’t deny the desirability of such familiar renewable energy sources as wind and solar. However, asking wind and solar generators to be the sole replacements for the power currently generated by fossil fuel plants runs into the problems of scale. Not every location in the world is ideal for wind or solar energy gathering equipment. Landowners willing to host large numbers of solar arrays need to be found. Birds colliding with wind power generators create new problems. And then, as the old sailing ship captains would point out, the wind is not always a reliable source of energy. The nuclear power generation methods being advocated by the young idealistic subjects of Schumacher’s film go beyond current nuclear power technology. The Nuclear Power 2.0 they want to create addresses both previous safety issues and the disposition of atomic waste. Subjects Leslie Dewan and Mark Massie of Transatomic Power want to tweak what’s technically known as a molten salt reactor. By contrast, subjects Jacob DeWitte and Caroline Cochrane of Oklo want to build a passive solid state reactor which draws its power from a solid fuel block for rural and other off-the-main-grid communities. Ironically, the technology the founders of Transatomic Power and Oklo are examining has been around for decades. The ace in the hole of these four young (and admittedly attractive) nuclear physicists is their belonging to a generation which can look at nuclear power’s possibilities without the psychological baggage this power carried in previous decades. For example, these scientists don’t see nuclear waste solely as something that needs to be stored for tens of millenia. Instead, such waste has the potential for generating more electrical power with a bit of treatment. One interviewee describes nuclear waste’s current energy potential as akin to having a log in the fireplace and throwing it away after burning off the bark. The bubbly confidence displayed by Dewan does help sell these entrepreneurs’ projects as possibilities. But how much of the viewer confidence in Transatomic and Oklo’s work is genuinely earned? How much comes from the human tendency to trust physically attractive people more easily? It can’t be denied that humanity has been forced by its procrastination on addressing climate change problems into a corner where being spectacularly picky about available solutions is no longer a reasonable tactic. Nor can it be denied that looking at and even tweaking possible yet abandoned nuclear technology might provide a key to new answers. But it’s unclear from Schumacher’s film what sort of waste the nuclear technologies examined by Transatomic and Oklo will generate or if he’s saying existing nuclear waste can be used to create perpetual nuclear energy. But trying to make nuclear power 2.0 production a reality is more than just a technical problem. It’s also a political problem with emotional facets. Dewan, De Witte et al. are not expected to address emotional concerns about nuclear power 2.0. That’s what elected officials are there for. But they do need to realize that technical implausibility didn’t lead to the abandonment of the Integral Fast Reactor. It’s reasonable to expect people to worry about defects or potential misuse of these new atomic technologies, as this problem is an unfortunate part of human nature. Also, if nuclear power 2.0 does pan out, will its benefits be limited to just the elite? In any event, at least this viewer is curious to see how Dewan, De Witte et al.’s efforts pan out. .
Gonzalo Guajardo’s short documentary “I’ve Seen So Much” begins with a close-up of a nail being hammered into a plank. What makes this common action distinct is seeing both hammer and nail confidently held by two pairs of toes. Possessor of these nimble extremities is film subject Ethiopian carpenter Sintayehu Tesale. An unknown disease left the carpenter at birth able to move only his feet. Yet today he saws lumber with a circular saw, pours juice at the breakfast table, and also has a family. Guajardo keeps his portrait of this unique subject from devolving into ableist claptrap. The director’s presence is limited to minimally explaining the contexts of Tesale’s story. The humbly inspirational lessons of Tesale’s existence come directly from the film subject rather than being made by directorial voiceover. “I’ve Seen So Much”’s brevity helps make its moving points without drowning the viewer in sentimentality. A nice human interest story, overall. 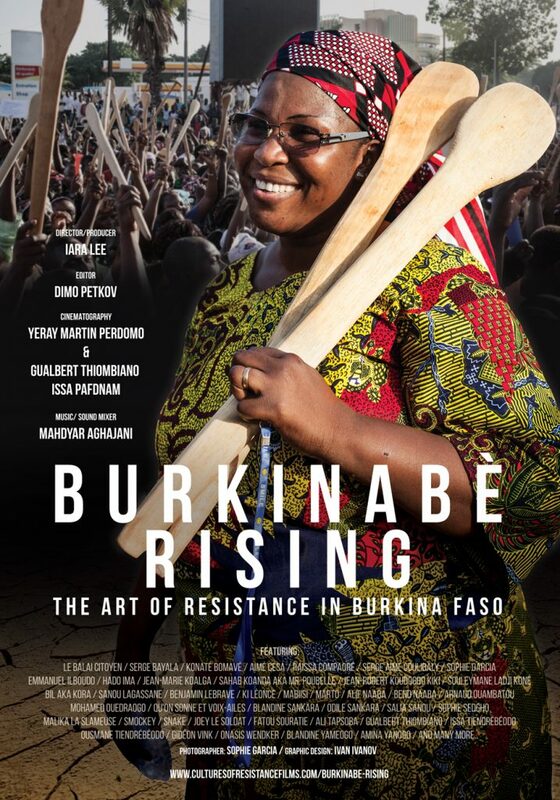 Iara Lee performs two vital services for American viewers with her new documentary “Burkinabe Rising: The Art Of Resistance In Burkina Faso.” Her sometimes thrilling film allows viewers to see how a country’s people used various types of art to resist an unjust ruler’s regime. Equally importantly, her film shows by example that when even the materially poor Burkinabes find ways to resist their corrupt leader’s tyranny, more materially rich Americans cannot justify in good conscience passively submitting to the tyranny of Trump and his totalitarian cronies. Burkina Faso was the country name leader Thomas Sankara chose in 1983 to replace the French colonizers’ name of Upper Volta. But four years after the much revered Sankara took power, closest friend Blaise Compaore led the 1987 coup that killed Sankara and cemented his hold on the country for the next 27 years. It took a popular uprising on October 30, 2014 to drive Compaore and his friends from power. Lee’s film shows how art allowed the 60 ethnicities that live in this landlocked West African country to be bound together as one people. Art gave the Burkinabe the mental fora to question Compaore’s status quo to the point that the people eventually realized when it was time to rise up and throw out their hated leader. Straight political arguments might cause potential converts to mentally tune out. However, dressing that same argument in humor or irony makes that same point incredibly sublime. Americans who enjoy the quips of John Oliver, Samantha Bee, Trevor Noah, Stephen Colbert, and Jon Stewart among others can attest to the truth of this point. Lee’s survey of Burkinabe resistance art shows the cornucopia of forms such artistic challenges took. They include Zongo-inspired rapper Joey Tha Soldier, the women’s organization La Saisonnere which promotes literacy and organic gardening among its members, and the filmmaking group Cine Droit Libre. But the claim to most astonishing personification of art and political activism belongs to actor Smockey Banbara. His stage role as a critic of the Compaore government gave way a few days later to his being one of the 2014 uprising’s leaders. The incredible variety of artists Lee captures, from a band whose members come from both sides of a border to a Muslim female poetry slammer, surprise with their diversity. Yet “Burkinabe Rising” does occasionally stretch the concept of Burkinabe artistic resistance in unconvincing directions, such as a sequence on hut building’s intricacies. Lee often circles back to the subjects of Sankara’s legacy and Compaore’s corruption. Sankara is generally remembered more often in epigrams than specifically identified accomplishments. The abuses of the Compaore regime need a little more enumeration beyond the hated leader’s setting himself up as president for life and his selling out the Burkinabe farmers to the likes of Bayer-Monsanto. But if the film’s handling of Burkina Faso’s politics feels a bit wanting, the musical samples heard throughout the film will raise desires for a David Byrne-like musical curator to assemble collections of Burkinabe resistance music. Ever wonder why the UN sanctions against North Korea haven’t stopped Kim Jong Un and his cronies from either living large or ramping up their nuclear weapons program? The horrifyingly complex answer can be found in Carl Gierstorfer, Sebastian Weis, and Jonghun Ryu’s infuriating and tragic documentary “Dollar Heroes.” It involves next-level wage theft, the complicity of governments in such places as Russia and Poland, and the capitalist obsession with obtaining labor as cheaply as possible. As the film explains, the North Korean government sends over 150,000 North Koreans to work outside the country as cheap welders and other manual laborers. The incredibly high “party dues” these outside workers “pay” bankroll both the North Korean ruling elite’s lavish lifestyle and the purchases of nuclear weapon parts. North Korea’s basic industrial structure means the country can’t build its nuclear weapon parts in house. Both internal and external controls keep these “dollar heroes” in line. Job-site monitoring makes even casual conversations with strangers cause for the managerial hairy eyeball. What little money these forced laborers manage to earn for themselves abroad is far more than what can be made living in North Korea. Finally, the families of dollar heroes are kept in North Korea under the government’s thumb to ensure the promise of retribution will deter these heroic workers from entertaining foolish thoughts of defecting. Given these pressures, information about the long-running dollar heroes program is understandably hard to come by. The reporters who traveled to Russia, China, and Poland deserve medals for patiently piecing together Kim’s long-running lucrative scheme, which brings in $1 billion annually to North Korea’s government. There are anonymous workers who provide personal details such as a tendency to heavy drinking among some dollar heroes. Also helpful in providing big picture insights are commentary from Professor of Korean Studies Remco Breuker as well as ex-North Korean official Kim Kwang Cheol. However, by the time the film ends, some important details of the dollar heroes program remain guesswork, such as how the money earned by these forced laborers gets back to the North Korean government’s hands. Despite public bloviating about the evils of North Korea’s nuclear program, powerful interests in quite a few prominent countries have little economic incentive to rouse themselves to action. The economic benefits of relying on “low cost” North Korean labor is great enough to turn quite a few powerful heads the other way. In fact, Russian police officers make early morning “extended inquiries” on the film’s investigative reporters after the latter ask one too many questions about cheap North Korean slaves working on Russian soil. Chinese manufacturers welcome laborers who can not only be paid less than Chinese workers but who also lack the worldwide opprobrium associated with Chinese starvation wages. The Poles are quite happy to ignore the existence of North Koreans working at least 10-11 hour days in their shipyards or in building construction. “Dollar Heroes” refrains from offering solutions to the dollar heroes problem. But alert viewers can think about some follow up areas. Does Poland’s complicity in the dollar hero system provide a fracture point for the EU to clamp down on Poland’s Law and Justice Party’s many totalitarian political excesses? What Chinese manufactured products exported to the US were actually made by North Korean forced labor? And is there an internationally civic-minded Robin Hood or a real life Leverage crew out there willing to employ their talents to seriously disrupt Kim Jong Un’s dollar heroes money stream?